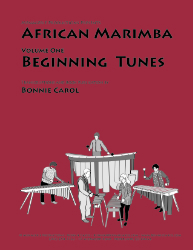 Pieces in these books are arranged for seven diatonic marimbas in the keys of C and G, and can be played on any of the Shona style marimbas that have taken this country by storm. 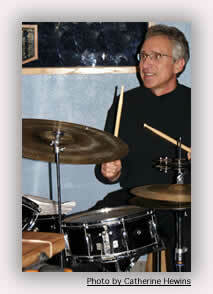 I learned the pieces from various teachers at festivals and in workshops. The first two in the series contain traditional and contemporary African pieces taught by Zimbabwean, Paul Mataruse, with whom many of us who are interested in Zimbabwean music have studied. 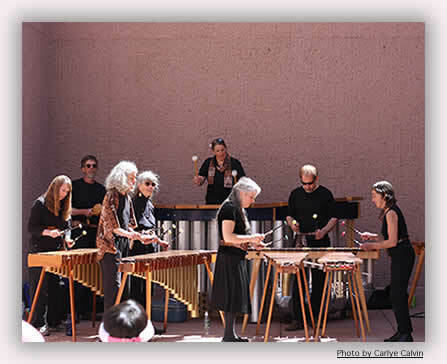 In addition to the Zimbabwean-style marimba groups, school and college marimba ensembles will find the pieces interesting, challenging, and appropriate. The pieces are written in standard music notation and have (usually) seven parts. 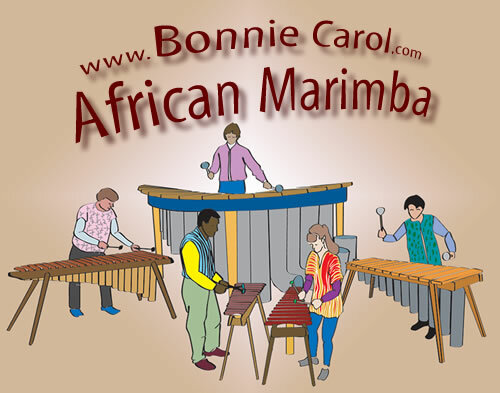 Bonnie plays in and directs WILD OKAPI MARIMBAS. Nothing can charge an event like colorful, lively, danceable African music. 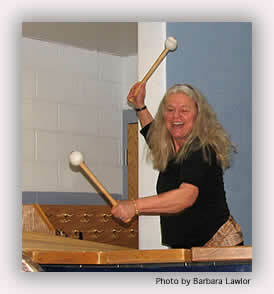 Great for formal concerts, dance parties, weddings, picnics, Zamboni christenings, community gatherings and ceremonies - you get the idea, we play anywhere people are having fun! 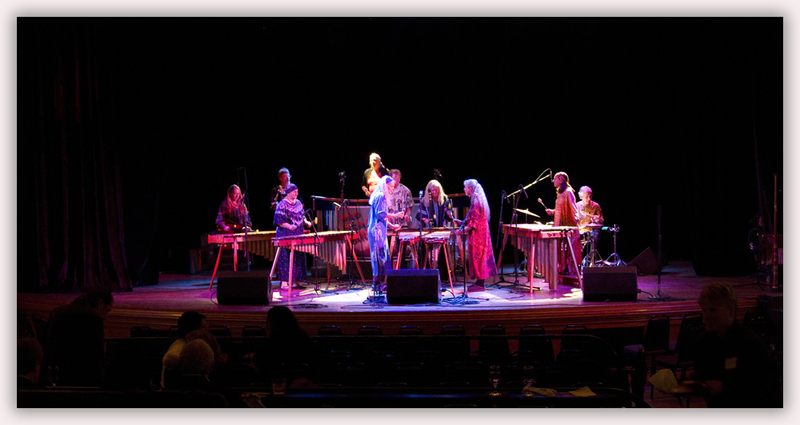 The centerpiece instruments of the group are the marimbas which Okapi member Max Krimmel built (seven of them; they resemble large xylophones). So… let these crazy cross rhythms transport your thoughts and set your feet to flappin'. Much of our marimba music is based on the mbira tradition of the Shona people, the majority cultural group in Zimbabwe. 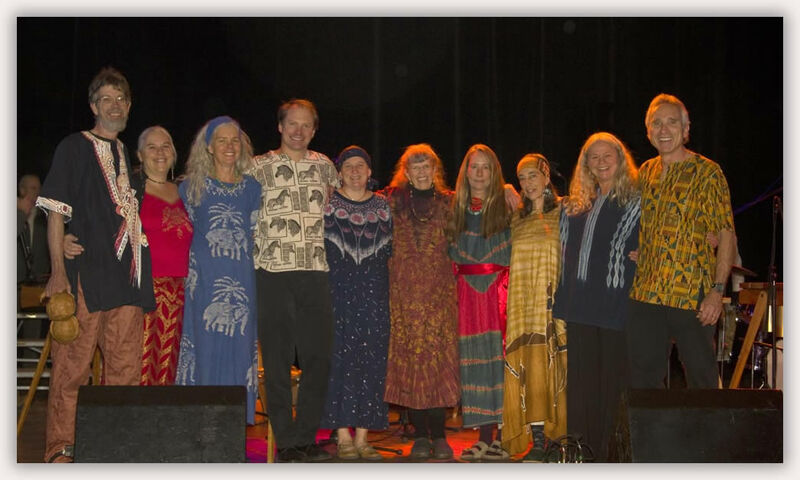 This music is known world wide for its intricate interlocking polyrhythmic melodies. The mbira is the ancient tribal instrumemnt of the Shona peoples, dating back thousands of years. 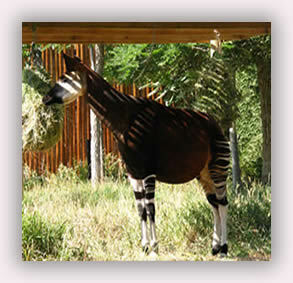 The OKAPI, our namesake, is a very decorative endangered relative of the Giraffe with a 14 inch long, blue tongue! 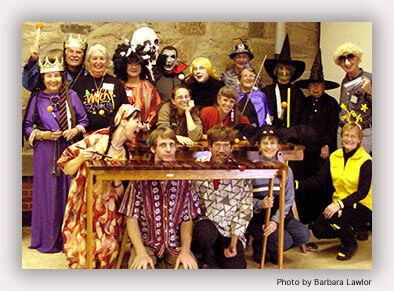 Theres little more fun than an African music concert or dance party as you see from this photo of the some scarey marimba friends on HALLOWEEN, 2001.